Comfortable to wear. White and black face paint available to purchase separately to complete the bunny look. In need of an Easter costume? Let this super soft and colourful Bunny Costume for Adults be your Easter spoil. Complete from the Bunny ears to the shoe covers, this Costume is great for anyone who is in need of a Bunny Costume for Easter or any time of the year. 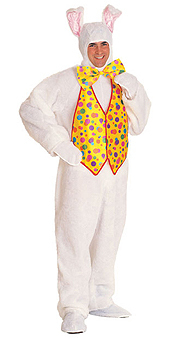 So hop to it and hide chocolate eggs for the children in this adorable Bunny Adult Costume.